WASHINGTON (AP) – President Obama is seeking to inject calm into a case that has inflamed passions, including his own. In a brief statement, the president called Martin's killing a "tragedy" but implored the public to respect a Florida jury's decision to clear George Zimmerman, the man charged in the teen's death. But now, with the man who fatally shot Martin acquitted and the burden of any future charges squarely on his own administration, Obama is urging calm. When President Barack Obama first addressed the death of Trayvon Martin last year, he did so passionately, declaring that if he had a son, he would look like the slain 17-year-old. His powerful and personal commentary marked a rare public reflection on race from the nation's first black president. As the nation's first black president, Obama is frequently pressed about questions of race, though he often refrains from weighing in. And on the occasions where he had, he's had uneven results. Obama's speech on race as a presidential candidate in 2008 was widely praised as an honest - and politically risky - handling of the tricky topic. But his 2009 comments about the arrest of a black Harvard professor in his own home turned into a political firestorm and the president was forced to retract his statement that police had "acted stupidly" in detaining Henry Louis Gates. Instead, Obama's comments - both in the weeks after Martin's death and following the verdict - have been more personal, focusing in part on his role as a father. "President Obama politicized this at the beginning of it, I believe, unfortunately, by injecting himself into it," said Karl Rove, former political adviser to President George W. Bush. Rep. Steve King, R-Iowa, said the president turned a law-and-order matter "into a political issue." Rove and King both spoke Sunday on Fox News. 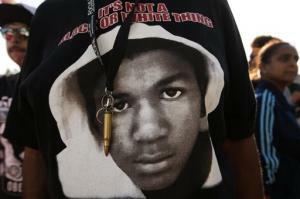 Zimmerman was acquitted Saturday in the February shooting death of Martin, who was unarmed when he was killed. Martin's parents and civil rights leaders said Zimmerman racially profiled the teenager when he followed him through a gated community and shot him, but Zimmerman said he was physically assaulted by Martin and shot the teenager in self-defense. The NAACP and other civil rights organizations dismayed by the Florida jury's verdict are calling on the Justice Department to open a case against Zimmerman. As of Monday evening, more than 22,000 people had signed a White House petition supporting DOJ charges. Senior White House officials have discussed the case with NAACP leaders in recent days, the organization said. But the White House insisted Monday that the president would not personally be involved in the decision to levy charges, nor would he weigh in personally on whether he supported that step.